Do you want to lose weight without ever counting calories, exercising or feeling hungry? Now you can with the help of the bestselling Weight Loss Superfoods series. Deborah Marks offers you a healthy way to shed pounds without a radical, calorie-restricted diet, or hours-long daily session in the gym. Eating a satisfying, naturally fat-burning diet has never been easier than with the recipes in her delicious cookbook series. Superfoods are whole foods with special properties to help you lose weight. They provide a powerful punch of nutrients and fiber in fewer calories than other types of food. Not only do you feel satisfied on fewer calories, but superfoods help you stay full longer. This helps you drop weight effortlessly without ever feeling hungry or needing to make endless trips to the gym. With superfoods, you actually eat to lose weight! Advice on how to properly store and prepare dark chocolate and wine to help maximize their fat-fighting nutrients. 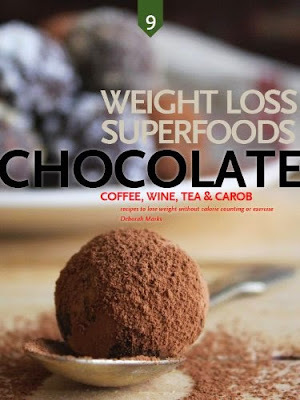 Information about the aspects of dark chocolate and wine that contain powerful properties that will help you control your weight or lose weight. Reading this book will enable you to make educated decisions about what to eat and how to lose more weight. Ideas and suggestions for working these foods into your meals to increase your fat loss potential. Deborah Marks loves whole food and likes to find ingredients when she can at the fantastic markets in the foothills of the Cascades near her home near Seattle. She combines the love her all natural food with her busy life as a researcher and Yoga instructor. She understands that incorporating superfood into your diet is a pragmatic endeavor, and throughout the book she balances the ideal with the pragmatic reality of including these foods and preparing your meals. Scroll to the top and click "Buy now" to begin to include the great and powerful superfood into your meal plan.